I have a confession to make. I am a faux-trailer maker. There, I said it. I admit it. What exactly is a faux-trailer maker, you ask? It’s a person who makes trailers for movies that don’t technically exist. And I’m one of them. I know, weird, right? What kind of a weirdo would spend the time, effort, and money to make a trailer for a movie that was never made? Anyway, it all started back in April when Joe and I released the “Ghost in the Graveyard” soundtrack. I got the crazy idea to cut together a trailer for the imaginary film that the soundtrack was written for. I thought it could allow the customer to hear the music used in a horror setting. Sooo, we called up an actor friend and put together a shot list and off we went. 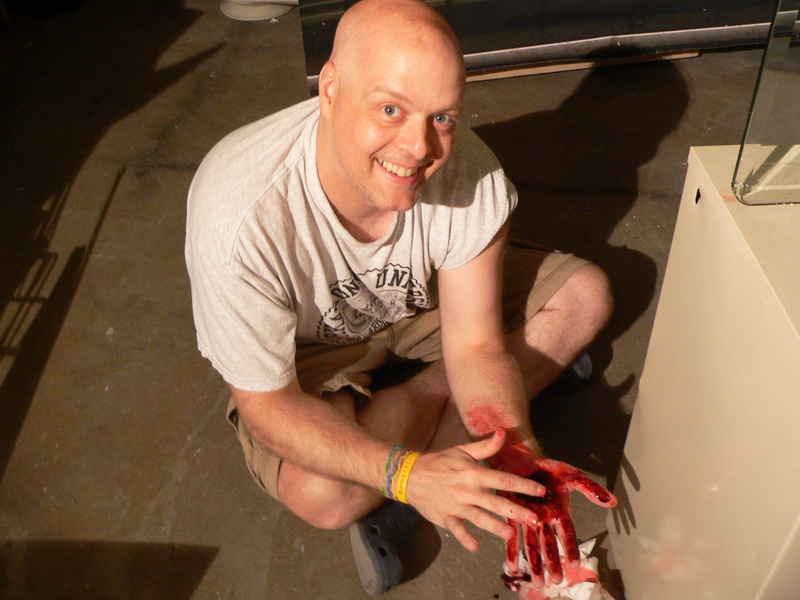 We shot the trailer, nobody got hurt (despite the bloody wound seen in the trailer!) and I had a blast. I thought that it would be a one-time thing. I was just experimenting, you know, pushing my boundries. But I enjoyed the feeling. After we finished, I started to miss it. Then in May we did our big photo shoot for our new board game “Specimen.” I saw my chance. As we were running through our setups for the new card images, I had Joe shoot some video clips of our cast looking scared and what not. We’re currently putting the finishing touches on the trailer. The photo up above is me working on some state-of-the-art special effects for it. We should get it posted real soon. So that will be two trailers and counting. I know, I know, I should stop. This can’t be healthy for me. If anybody knows about any support groups out there, please forward me the contact information. But I got to tell you, it’s so much fun, I don’t think I can stop. And I’m not sure I want too. Gotta go, I just had a cool idea for a trailer for “The Girl with the Dagon Tattoo” project. It will be epic. -Editors note. Steve is currently ‘resting’ in the Miskatonic Home for Wayward Trailer Makers. He is making excellent progress and hopes to be rejoin society and enjoy watching real movies, and the trailers that advertise them very soon.